One of the most common hummingbirds on the West Coast, the Anna’s hummingbird enjoys a wide range of habitats. It lives in wooded areas, parks and even backyard gardens along the coast and extends its range in winter months. Females nest with their young near food sources within their habitats. This tiny species, just a few inches in length, has primarily green and gray plumage plus a striking iridescent red throat. The year-round range of the Anna’s hummingbird extends along the entire western coastline of the United States, from Washington through southern California. It also inhabits the northern portion of Mexico’s Baja California peninsula and ranges slightly inland through desert areas of California, Arizona and Nevada. These small birds are not shy of dense human populations and are commonly found throughout the year in urban and residential habitats. In winter months, when the Anna’s hummingbird is not breeding, the species’ range commonly expands into warmer climes of northern Mexico and south along more of the Baja California peninsula. Less commonly, but still notable, they may also extend into Canada along the coast of British Columbia. Unlike many other hummingbird species, Anna’s hummingbirds do not fully migrate away from their primary range, where they can be found in all seasons of the year. The Chaparral shrublands of California and Mexico are a traditional habitat of the Anna’s hummingbird. However, within their geographic ranges, hummingbirds also enjoy urban, suburban and wooded locations. Their popularity in backyard gardens and parks stems from homeowners’ nectar feeders as well as exotic, nectar-rich flowers that make excellent food sources. 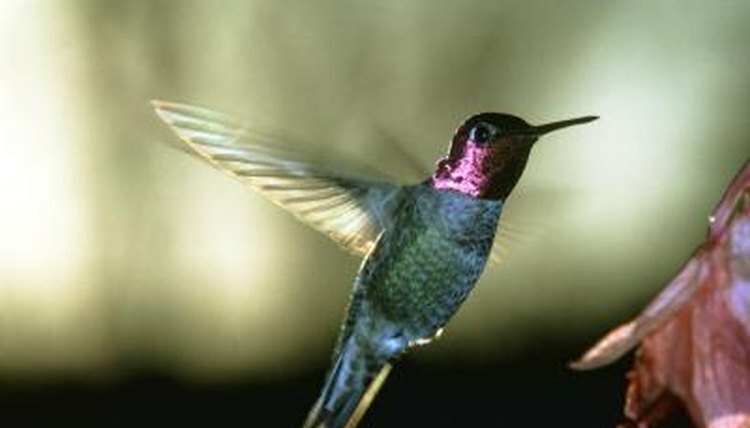 Anna’s hummingbirds are also found in eucalyptus groves and scrublands common to the West Coast. Within their habitats, female Anna’s hummingbirds create cup-shaped nests in which to live and incubate young. They build nests primarily on branches or in shrubs where food -- nectar and insects -- is easily found. The birds scavenge materials from their habitats to construct the nests, combining plant materials, feathers, lichen and even spider webs.